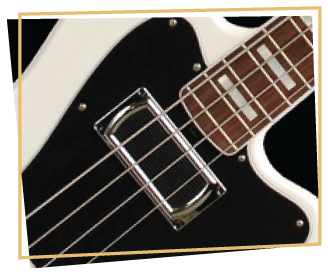 ChiSonic bass pickups are inspired by classic Swedish bass pickups built in the 1960’s. Using vintage spec large diameter pole pieces, bobbin and coil designs as benchmarks, we utilized the power and compact size of neodymium magnets to create a new kind of pickup that is powerful, yet refined. It is truly a marriage of vintage and modern. We fabricate, wind and build all ChiSonics pickups in our shop in Chicago, IL. 4 string sets are available in full chrome, narrow chrome; MM style and soapbar style covers. The MM will fit into the 44-94 and the 44-02 series and the soapbar will fit into the 44-01 series Lakland basses. I also have a smaller chrome cover with ring that we install in Lakland hollow bodies. We have just introduced a new CS4 neo version that is a closed cover direct replacement pickup for J-style instruments. 5 string sets are available in full chrome, narrow chrome, soapbar and MM styles. We have recently added the CS4 A-Vintage series of 4 string single coil pickups. These are alnico 5 driven, for a more 60’s vibe. These are available in full chrome, hollow body chrome and MM style.